When it comes to getting our travel snooze on, Chris and I tend to stay in vacation rentals for longer-term travel and hotels when we hop around from place to place. For Ireland, however, the guidebooks and travel websites I consulted consistently recommended the bed and breakfast route so we decided to give it a go. I’m sort of the Goldilocks of sleep accommodations with my light sleeper tendencies and a need for a fairly sound-proof room, but I went into the experiment with an open mind (and some sleep aids if needed). That said, I wanted a sure thing for a couple of nights when we arrived in Dublin because Chris needed to be one-hundred percent rested before driving a car. And I needed to be rested in order to navigate, look for photo ops, and make funny jokes to entertain Chris. So before I get to the B&Bs, I have to mention our fabulous hotel, the Radisson Blu Royal Dublin. 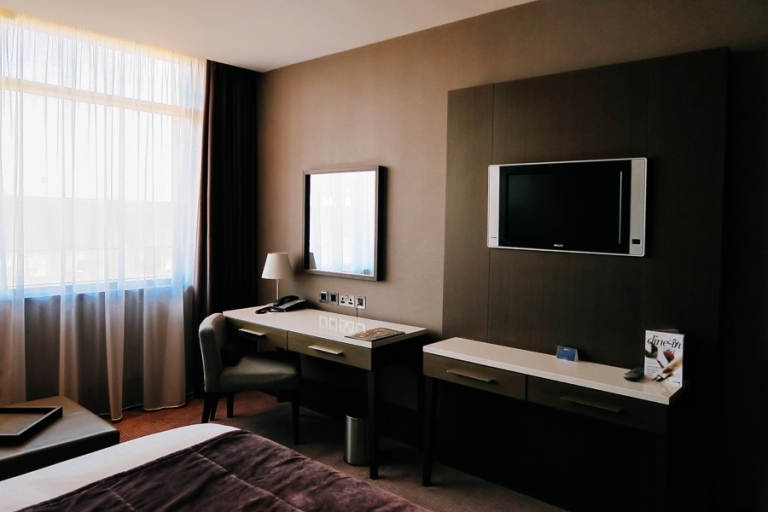 From a much appreciated early check-in to smooth check-out, we received impeccable service and we were so comfortable in our room. The bathroom in particular was gorgeous. My plan worked, because we left the Radisson Blu rested, recharged, and jet lag-free. Once we were on the road, we stayed exclusively in B&Bs all over the country. 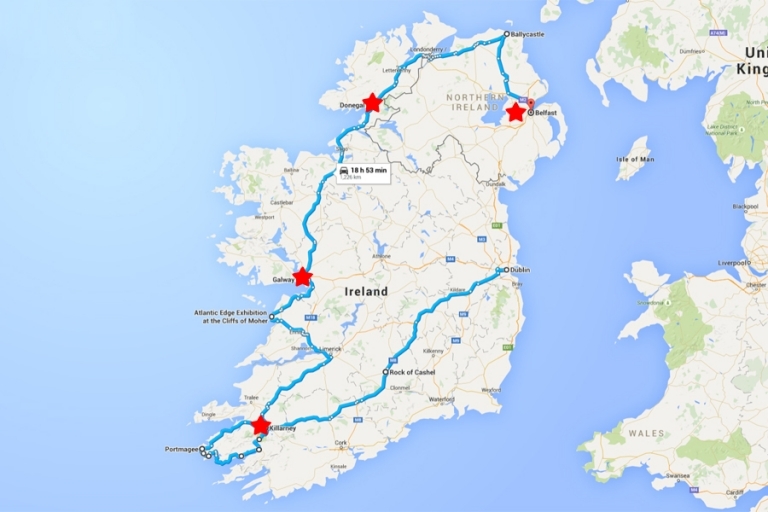 We spent two nights in Killarney, and one night each in Galway, Donegal, and Belfast. I’ve rounded up my photos and reviews to post here! Woodlawn House was officially our first bed and breakfast experience ever. We chose Woodlawn for proximity to the town center and the Ring of Kerry route, but I didn’t want to be too close to all of the action since I need a little peace and quiet for sleeping (see Goldilocks reference, above). When the owner, Wayne, greeted us with a friendly smile and took our bags at the front door upon arrival, I instantly warmed up to the charm of staying in a B&B. He even sat down with us in the living room to go over details about the B&B, the town, and he gave us personalized tips for our next day’s trip around the Ring of Kerry. Wayne’s advice was spot-on and his recommendations were some of the highlights of our County Kerry tour. Our room was simple, clean, and situated perfectly within the house on the top level in the back (per my request for a quiet room). The noise was something I was a little worried about, not knowing the ins-and-outs of B&Bs, but we didn’t hear a peep. In addition to the sweet little beverage station, we had everything we needed in the room with one exception: a larger bed! Chris and I are used to our spacious king-size bed at home, and this one was a double, not even queen-size. I’m sure if I had mentioned it we could have moved to another room, but I didn’t want to give up our super quiet location. Plus we were so tired at the end of each day that it didn’t really matter in the end. We crashed pretty hard both nights. Not pictured: the beautiful dining room where we enjoyed a lovely breakfast on the second morning. (The first morning we left early and went straight to the Ring of Kerry.) I didn’t know what to expect from the “breakfast” part of B&B, but Woodlawn offered a huge spread of breads, cereals, jams, and juice/coffee, in addition to hot menu items limited to pretty much anything you can think of for breakfast. I could get used to this! I have to admit, the words “boutique” and “gourmet” on The Herons Rest website caught my eye and I wondered what differences we’d see at our next B&B in Galway. See that blue building on the left in the photo below? That’s The Herons Rest, and that window on the roof was our room. Stacks of fluffy towels, robes, port wine, still water, craft soaps, cotton rounds, and even make-up remover wipes. 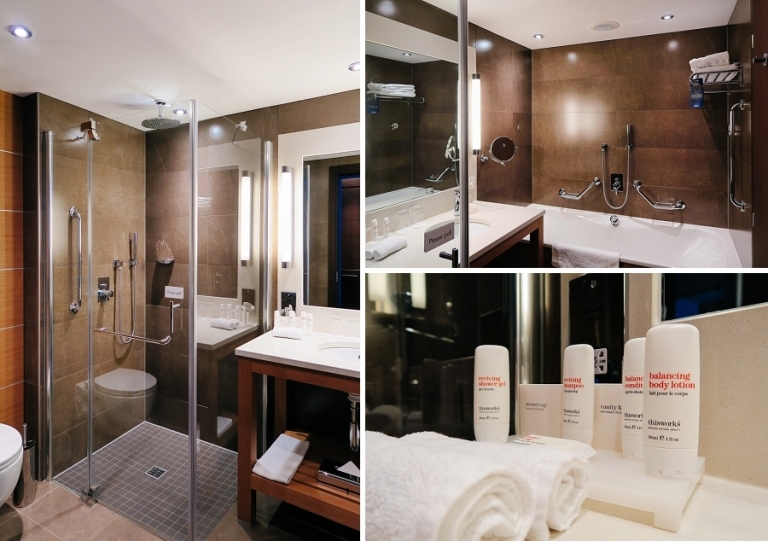 Amenities in every nook. Plus we had use of that pop-out balcony roof window for stunning views of the river. On the downside, the room felt just a bit cramped, especially for Chris due to the pitched ceiling, and the parking situation wasn’t ideal. We were instructed to park on the street as long as we fed the meter first thing in the morning, or park a block away at another hotel’s garage. We decided to park in the hotel garage, which meant schlepping our stuff a bit of a distance. But in the plus column, in addition to all of the amenities, the top floor location provided us (me?) with the quiet that I need to sleep, and the gourmet breakfast was superb. Um…unfortunately I ate it too quickly to take photos, but I did at least grab a picture of these pretty muffins. 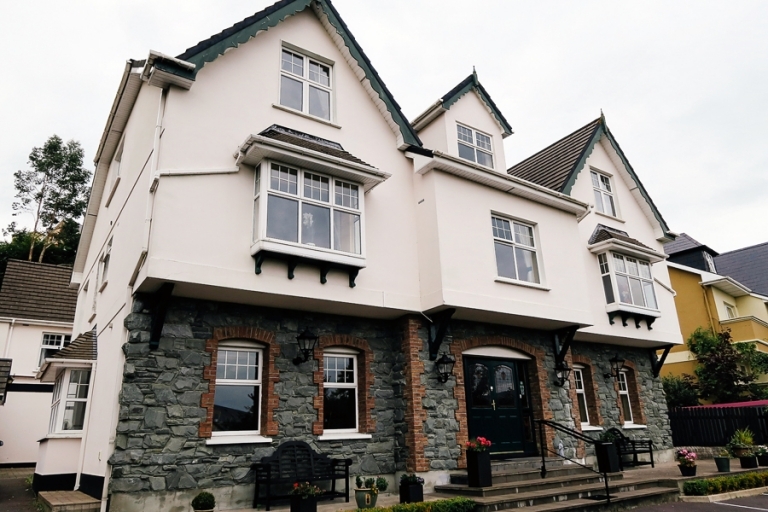 There are plenty of choices for accommodation right in Donegal town close to the pubs and shops, but I was curious about The Arches Country House based on their glowing reviews. With only a ten-minute drive from town, I figured we could give countryside living a try for one night and I’m glad we did. I could have stayed here all week. We stayed in Room 1 upstairs, and we had so much wonderful space we hardly knew what to do with it. This two-bedroom room with dual sitting areas would be great for a family or for a group of friends, but we also enjoyed it just for the sake of spreading out and having some breathing room. The incredibly comfortable bed and perfectly quiet surroundings had me rethinking our early schedule the next day. And I can’t forget to mention Noreen, the owner and our gracious hostess for our stay. We thoroughly adored her hospitality and cooking. The bathroom was bright, clean, and very spacious as well, with a shower (not pictured) big enough for a horse. I specifically want to point out one of my favorite details about the room though – outlets! There were plenty of electrical outlets everywhere: next to the bed on both sides, next to the vanity, and on the walls. Chris and I love gadgets, so naturally we love outlets which are sometimes hard to come by when we stay overnight in various places. If we were staying longer, I would have loved to curl up in a chair at the window with a cup of tea and gaze at this view. If you’re looking for somewhere utterly tranquil to stay in County Donegal, this is it. 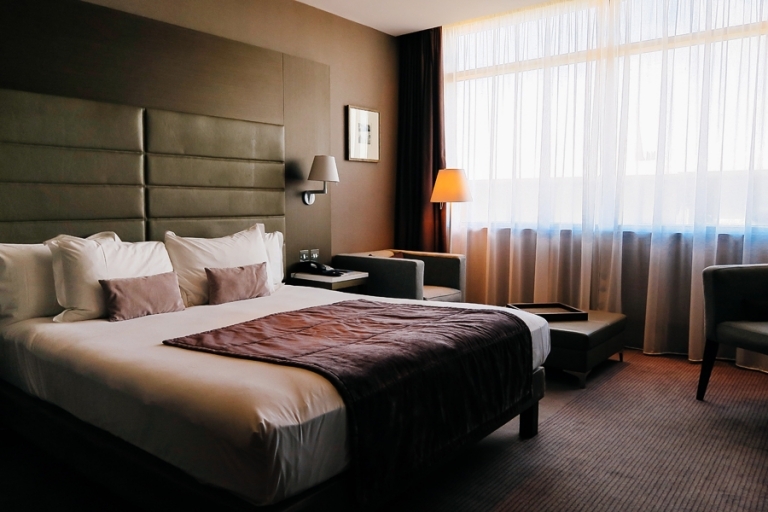 I hardly feel qualified to review Bay Cottage since we were only at the inn for less than twelve hours, but I wanted to mention it because of the convenience to the Belfast International Airport. Owner Elizabeth sweetly helped us get settled and we appreciated her warm reception even though we were atypical sleep-and-run guests! We couldn’t even stick around for breakfast. Our flight to Scotland left at around 8am the next morning, so being as close to the airport as possible was a huge help, especially since we were driving ourselves there and returning the rental car. The drive from Belfast City to the airport would have been about 30 minutes and possibly stressful in the dark. We were up and at em’ around 5am, and it only took minutes to get to the rental car return area from Bay Cottage. I took a quick photo of our room (the Blue Room) after dark, but please pop by the website to see cozier photos of the Cottage. Final verdict on B&Bs in general? I’m so glad we tried this approach to our accommodations in Ireland! I had fun chatting with the owners and with other guests, and it was interesting to see the differences between the inns. I couldn’t get over the value for our money; in most cases the B&B option saved us quite a bit of money compared to a hotel stay in the same location. Chris wasn’t as keen on the B&B lifestyle though. He said, “When we go out and come back, I feel like I’m sneaking into someone’s house.” So I can’t say we’ll only stay in B&Bs from now on, but it’s nice to have another viable option in certain locations. Deanna - Thanks for the information on the B&Bs. This solidified my choice stay at B&Bs. Susan - Hi Deanna! How fun! It’s definitely a whirlwind to do the itinerary we did, but it’s totally possible if you don’t mind long days. I think we were usually on the road by 8 or 9am, and most days we didn’t check into our next B&B until dinner time. We felt totally safe the entire time we were driving around. GPS worked perfectly in all of the areas we visited. I probably wouldn’t drive around alone in Belfast at night (based on advice from locals), but elsewhere seemed reasonably safe. Get a small car if you can – some roads are quite narrow! Oh, we also rented a wireless hotspot from our car rental place. It came in handy to look things up online, stay in touch, etc. Have a great time!